Souvenir: Frédéric Poincelet’s Le Périodique | Comics Vacation! I picked up this collection on what will be the first of many trips to boutique comics shop Le Comptoir des Images here in Angoulême. I will probably devote an entire post to this shop and its relationship to the surrounding artistic community, so suffice it to say for now this place is simply awesome. There was a large selection of books present by local and beloved publisher Éditions Ego Comme X, so it was difficult to choose just one. They are beautiful to hold, lovingly-crafted, high quality printings with an intimate and personal feel to them. Once I had my selections narrowed down to a small handful, I made my final choice based on what in other circumstances might be superficial criteria: economy and design. 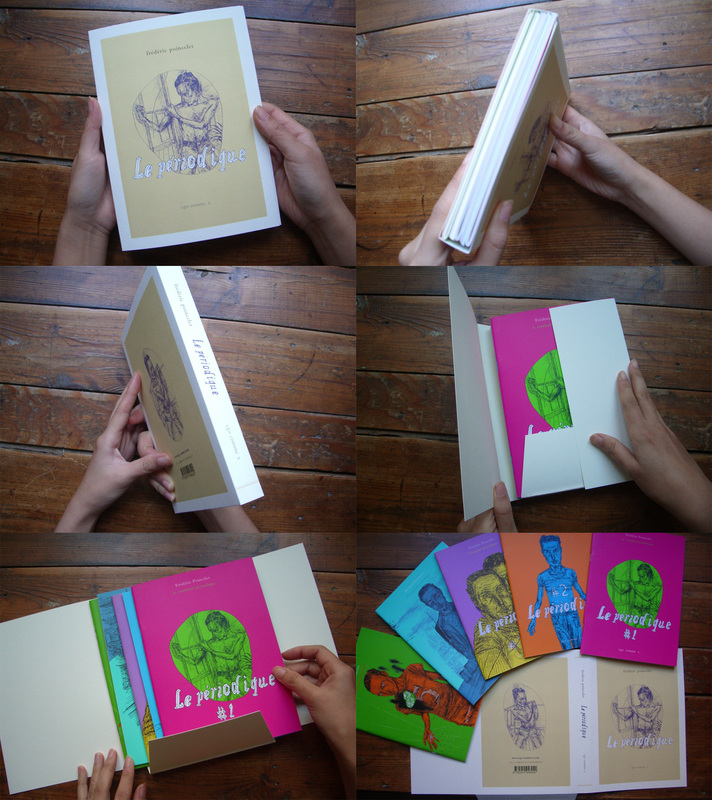 The coffret (“little box”) Le Périodique (“journal”), is a collection of five 32-page autobiographical zines by Frédéric Poincelet, originally published between October 1999 and January 2002, nestled together in a beautiful cardstock sleeve and re-released in January 2013; priced at 19€, I couldn’t pass this up. Rather than compile these zines into one collection, I think it makes sense to keep them as individual episodes; the covers present the volumes in what might be unique periods in the author’s life: combatif, égocentrique, excessif, dépressif, and définitif, all presented in a gorgeous matte finish and dynamic colors.. Poincelet’s stories are made up of a series of smaller experiences and full of little details; this format compels the reader to sort through these details, adding to the author’s loose and personal narrative style. Fredéréric Poincelet has a historian’s attention to detail, recounting these stories as memories like you and I would—memories of love, desire, and creative exploration—but full of visual metaphor. These stories are unique too, in that he writes them as both an artist and fan, capturing the time period of the medium and creative process of the comic book artist, name-dropping his influences (Dupuy, Killoffer, Trondheim) along the way. These stories strike a perfect and honest balance between humility and pretentiousness, a space that most of us can relate to, albeit reluctantly. This publisher is a well-curated, literary comics small press of the first order. 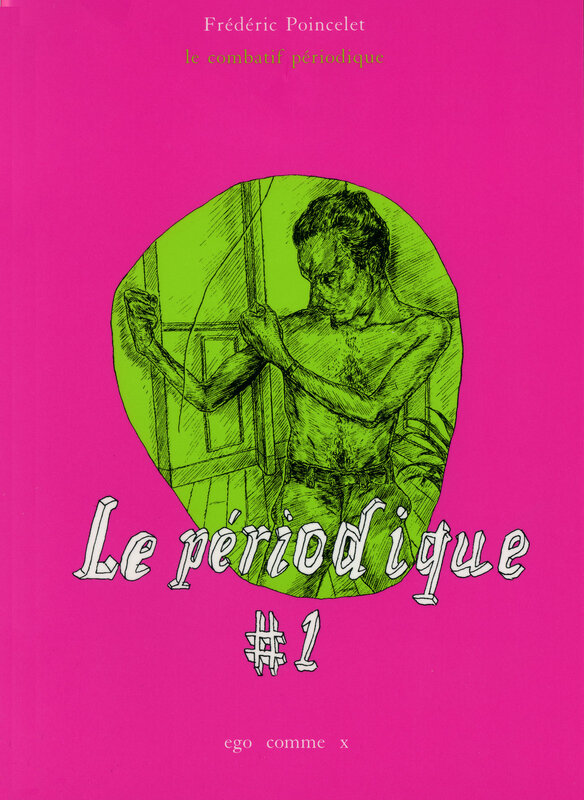 Founded in Angoulême in 1994 by Xavier Mussat, Fabrice Neaud, and current editorial director Loïc Néhou, they have kept their output to an impressive, but minimal, 4-5 releases a year. With a keen editorial eye to autobiography, diary, and memoir, they have published an impressive roster of international auteurs: Aristophane, Frédéric Boilet, Jeffrey Brown, James Kochalka, Benoît Peeters, John Porcellino, Sylvie Rancourt, and many others.